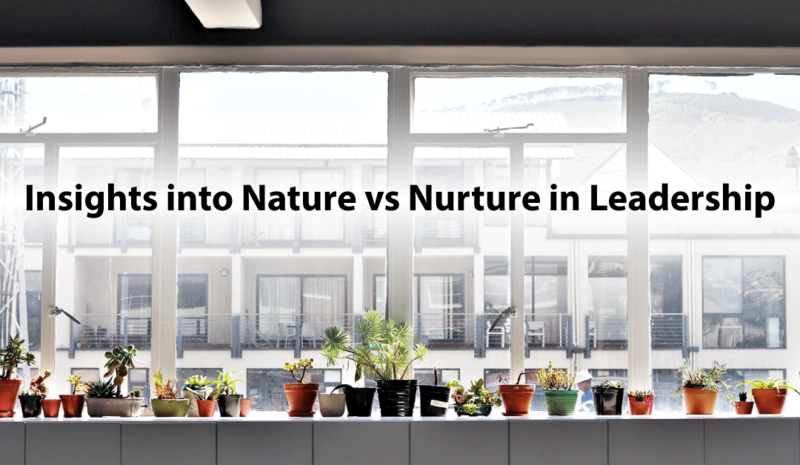 Well, what is your insight into the Nature versus Nurture controversy in leadership? You may very well believe that leadership takes talent that is born in someone. You may even have a talent for leadership. However, defining ‘talent’ can be more complicated. Many believe that talent is something you are born with, that takes little to no effort on your part, and that doesn’t require practice. The dictionary says that it is an innate ability to do something. There are those who believe that talent is only applicable to the arts like music, painting, etc. I believe that reluctant leaders have the talent and use it on every day roles. I had a discussion with a GenXer who said that she knew no one of her generation that did not boldly step into leadership; that her generation was all about independence. Personally, I don’t believe that independence equates to natural talent in leadership. In fact, I would say that independence may actually take a person out of building and leading teams into more individual contributor roles or solopreneur situations. With this generation getting to an age where they could be taking on C-level positions in companies and Board of Director positions, I would expect the percentage of women in those roles to rise. I would also expect to see them as top leaders in their Network Marketing business as well. Tell me, why are so many of the Network Marketing/ MLM / Direct Sales companies now run by men. In truth, the numbers have remained in the 11-16% for a decade. If it were true that learning leadership skills is not needed, then where are they all if not in key leadership positions? Regardless, talent may get you through many leadership scenarios, but it won’t make you wildly successful. It truly takes learning the skills of leadership to hone your craft and have a tribe that follows you enthusiastically and with excitement. This takes discipline and dedication to your leadership ability. Even the greatest military leaders learn strategy, tactics and the art of leading through the writings of leaders who have gone before them and through mentoring with successful leaders. Defining “skill” is relatively easy: a ‘skill’ is something that can be learned with direction. This could be through a course, a mentor, or a coach. These skills are developed experientially as you work with your team. You will make mistakes and be awkward in the execution. Some skills will come easily to you and you will execute them flawlessly. There are other skills that you might struggle with and need feedback of what is working and not. By applying yourself to the learning, you will be able to fine tune your skills in such a way that it just becomes you – you are now unconsciously competent! Reluctant leaders are often afraid to make mistakes. I would ask you: did your children come with an instruction manual? If you were afraid to make mistakes, would anyone have children? Because of this gap between talent and skill for network marketers, I teach The Art of Herding Cats: Leading Teams of Leaders — to provide you the skills to step boldly into your leadership abilities. You will learn the 12 powerful steps to building and retaining thriving teams of leaders. Join me! Something else I have learned as a business woman is to ask for what you want. If you loved what you just read, this content is not for free. As a form of payment, I am asking you to comment or share this on Facebook or tweet about it on Twitter.